This photo demonstrates the magical quality that our products can lend to a display. 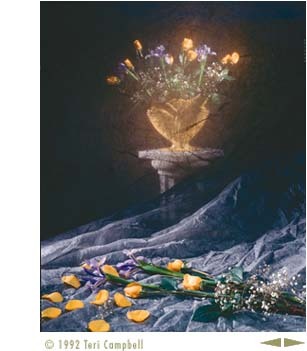 Teri Campbell is using the opaque effects of front-lighting in the foreground and a translucent effects by back-lighting the vase in the background with a spot. Here you can see the grey color of the cloth in the foreground, because the light there is falling on the cloth from the front. The cloth will have color and shape when lit directly. Otherwise, an object illuminated behind the cloth will show the texture of the backdrop; in this case Chameleon, which you can see imparts a glowing "antiqued" effect around the vase.